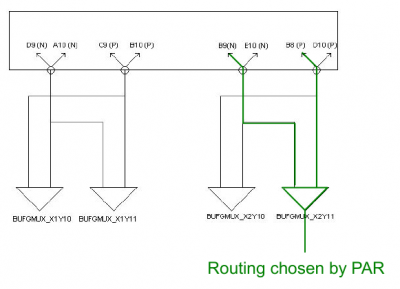 Leaving the Place And Route tool to do its job it routed the signal using BUFGMUX_X2Y11 as in figure b. 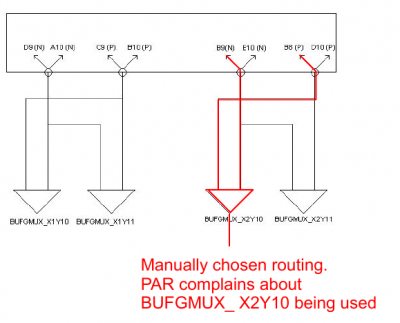 It is not very clear in Xilinx documentation what the restrictions for allocating clocks to inputs of a BUFGMUX are but conveniently in the Spartan3A it seems to work this way: In a BUFGMUX pair if the Ynumber is even then the even numbered clock should go to the even numbered input. So for example if using BUFGMUX_X2Y10 then GCLK4 should connect to I0 and GCLK5 to I1. See figure d below for mapping the global clocks to the X2 pair of BUFGMUX. Note however that BUFGMUX come in pairs so if using both inputs of X2Y10 then X2Y11 cannot be used. If trying to do so you will get an unroutable error from the PAR tool.